As I've mentioned in my last post, I love attending seminars not just for freebies but for the added knowledge that could boost my confidence as a person. 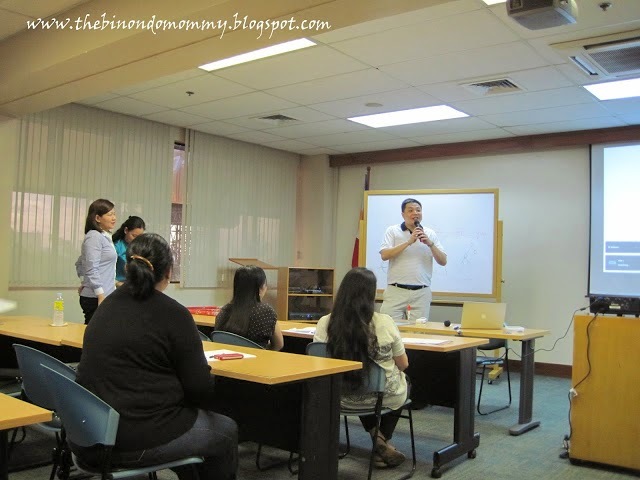 Last Saturday, Feb. 1, 2014, I attended a workshop. This time it's not about parenting but about a more serious stuff: Business. I graduated a college course in Entrepreneurship but I'm embarrassed to share that I haven't applied or haven't ventured into being an entrepreneur yet. I envy and look up to those people who have their own businesses, has a direction in life and let money work for them. I've been meaning to become a mom-preneur but didn't know how or where to start. I was so excited to listen to this seminar, hoping that it could change my life somehow or at least my attitude. The title of the event is Seeking Business Opportunities. 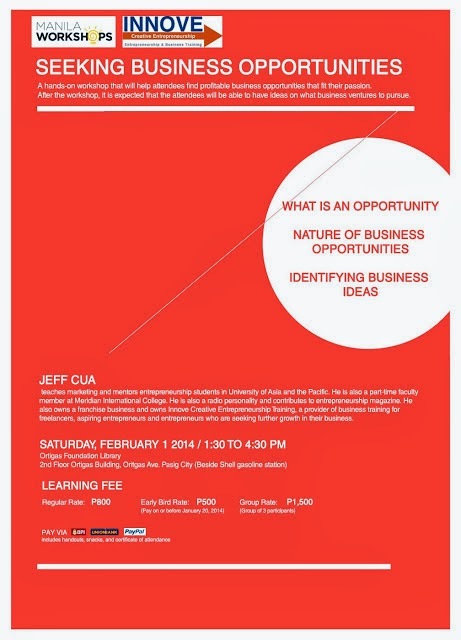 Let me share with you the things that I've learned or noted down from the lecture of Mr. Jeff Cua. Pardon my poor note-taking skills. These were the only things I have picked up. And also because I came in late that's why I wasn't able to get the earlier parts of the talk. Part I: There are Two (2) Sources of Ideas: Problems and Untapped Resources. Part II: Create a Differentiated Solution. * Problems are found in the community or found everywhere. * In seeking business opportunities, you should be in the know. You should know the current events or latest news. * Always begin with the problem because problems will lead you to customers. * It's an opportunity if there's money there. * Think of something you've never seen before. * Follow the basic supply and demand principle. So there you go. Enough of the serious stuffs, let me show you some of the photos that I was able to take during the event. 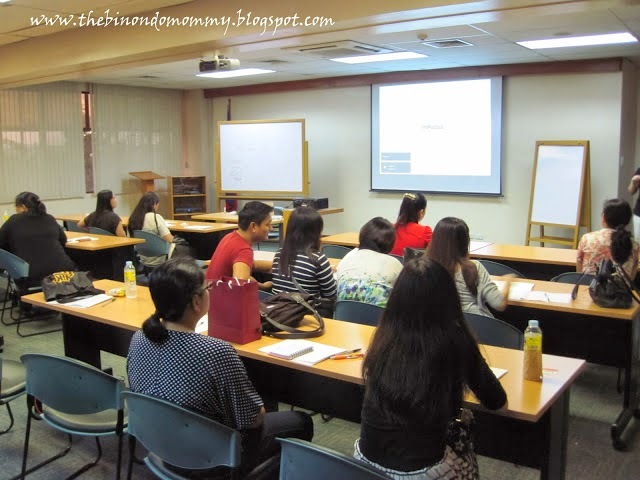 Attendees seated in a conference room inside the Ortigas Foundation Library after the break. 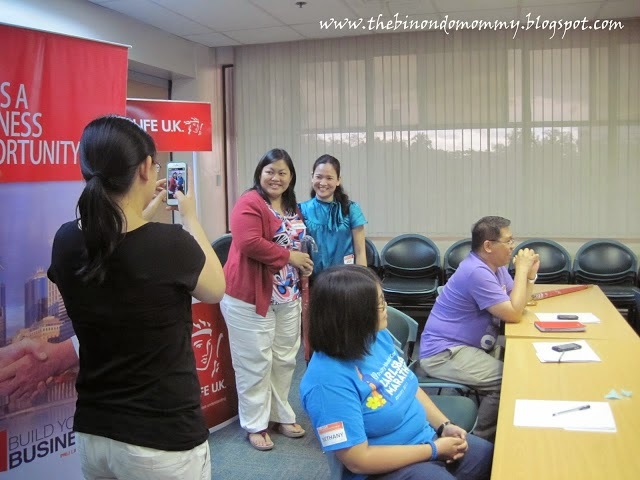 People from PRU LIFE U.K. gave a speech and invited everyone to attend their "Build Your Business" event. PRU LIFE also raffled off some prizes to lucky attendees, such as umbrellas and planners. 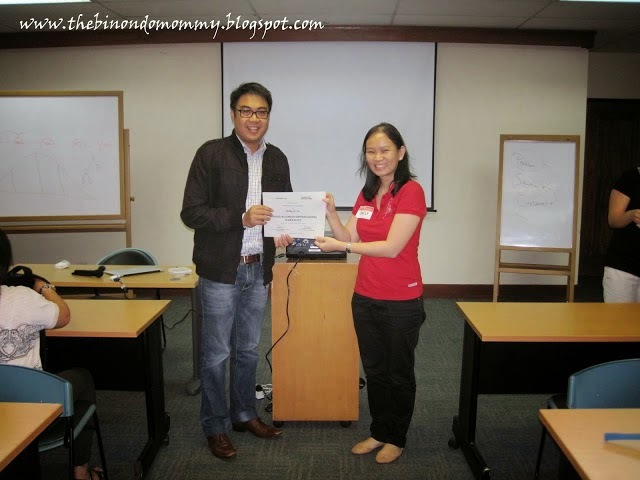 Picture with the speaker Mr. Jeff Cua and distribution of Certificate of Attendance. 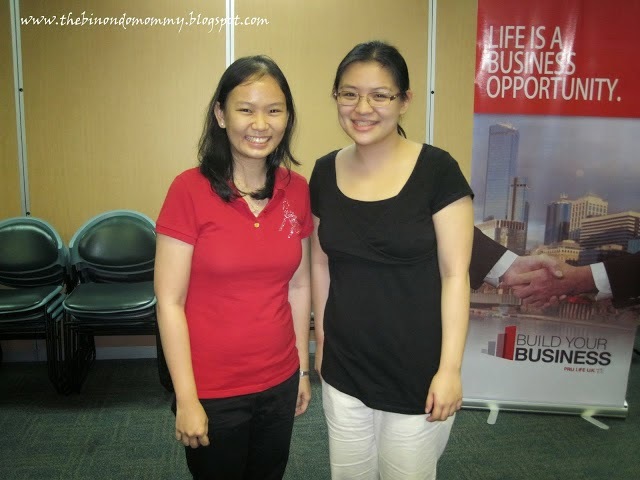 Ofcourse, picture with the organizer and owner of Manila Workshops, Mommy Ginger. 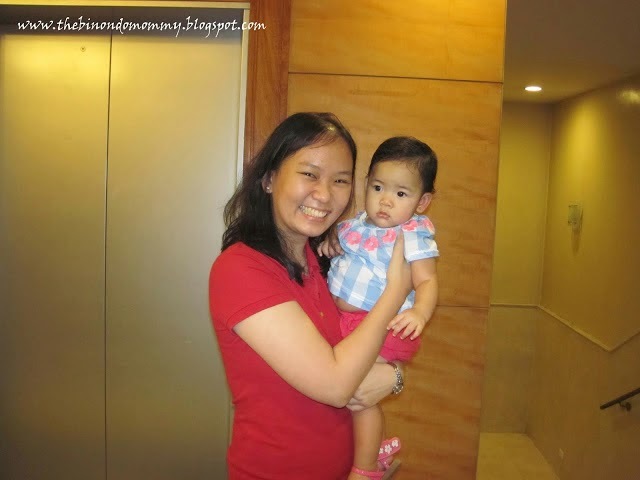 Picture with the oh-so-cute fashionista Baby Zeeka! I missed my baby. 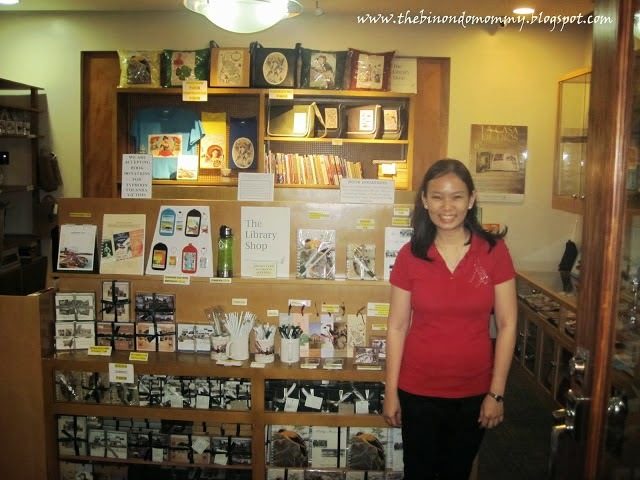 It was my first time to know about this place, Ortigas Foundation Library. 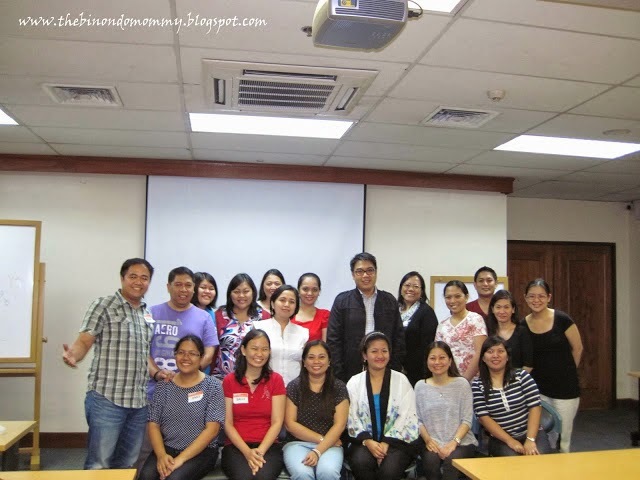 Thank you Manila Workshops and Innove Creative Entrepreneurship for coming up with this kind of seminars. 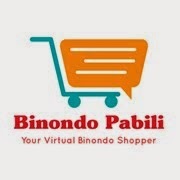 Please click the link and connect with them through their Facebook Page to know more about their upcoming events. Hello Sally, I wish we were able to speak on that day. Imagine, if I did not see your post on Mommy Bloggers Ph, I wouldn't even know that you were there. I'll link to your post when I write my own post about the seminar. God bless you! I really wanted to join that workshop! Sayang talaga that the whole family got sick. And I didn't want to bring the virus there. Hehe! If someone is looking for new licensing opportunities, then he must know that hiring an experienced and qualified business broker can pay huge dividends.